ACE Lab is proud to announce the start of the technological partnership with Donor Drives – the world's largest supplier of donor hard drives and PCBs. Donor Drives is well-known worldwide for its highest level of arranging donor hard drives for data recovery experts. Their fully automated inventory enables to get the necessary donors as fast and easy as possible. Now ACE Lab's new partnership with Donor Drives will help data recovery professionals get donor drives even easier and faster. The latest software version 6.0 of the PC-3000 allows users to order donor hard drives directly from Donor Drives without leaving the PC-3000 interface. 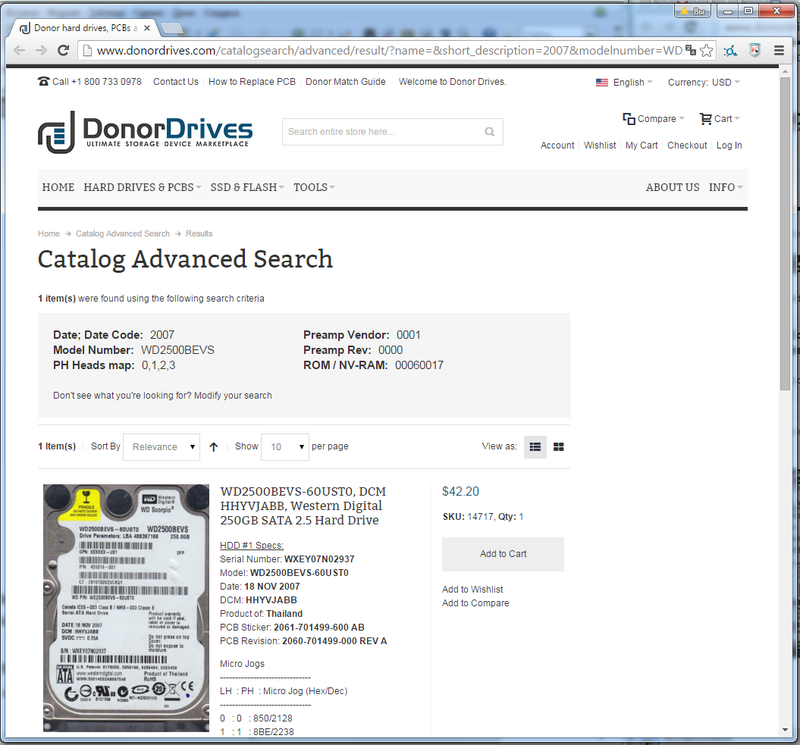 The new functionality facilitates the process of finding an appropriate donor for hard drives of all families. It is available in the “Utility Status” menu (see Picture #1). All these parameters are further used for searching the appropriate donor drives. After you click the “Search” button (see the Picture #2), the PC-3000 Utility will open a new window of your Internet browser and will send a request with your parameters to the Inventory System of the ACE Lab's partner Donor Drives LLC. The external (DCM, Product of, Site Code, etc.) and internal (SN, MicroJogs, Headmaps, ROM F/W version, Hardware revision components, Adaptive parameters, Preamp info, etc.) parameters taken from the PC-3000 Utility are passed to the Donor Drives Search Engine, which delivers the search result within a second, showing the suitable parts for your patient drive (see Picture #3). Currently, the “Search Donor Drives” function is available for the customers in the North America, Europe and Australia. We are planning to broaden the coverage to the worldwide scale in the near future. We will be further expanding this partnership with Donor Drives, so that data recovery professionals will be able to enjoy more convenience and even greater efficiency. To see how the new “Donor Drives Search” works, try the latest version of the PC-3000 software!